Start with a square and two line segments of equal length at right angles that start at the lower left and finish at the lower right. Subdivide the square into four equal subsquares and form a new polygonal path with the motif shown above consisting of four pairs of triangular line segments at right angles, with one pair in each subsquare. For the next iteration, repeat this construction on each of the four subsquares, with the motif scaled by 1/2 and oriented in the same direction as the line segment pair in the original subsquare. This creates 16 new squares each containing a pair of triangular line segments at right angles. Now keep repeating ad infinitum. The motif is constructed by taking four copies of the original pair of line segments and rotating the first and last copies by 90° clockwise and 90° counterclockwise, respectively. The attractor for this IFS is the filled-in unit square [0,1]x[0,1] with four self-similar parts (the four subsquares.) The black "L" in each colored square indicates the orientation of that square according to the corresponding function in the IFS. 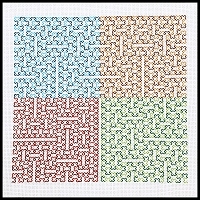 The image below of a back stitch embroidery shows the sixth iteration for the space filling IFS described here. The curve starts in the lower left corner and traces a continuous path through the red section into the blue, orange, and green sections, ending in the lower right corner. As noted above, the curve intersects itself at many points but never crosses itself. The piece was stitched along this continuous path. 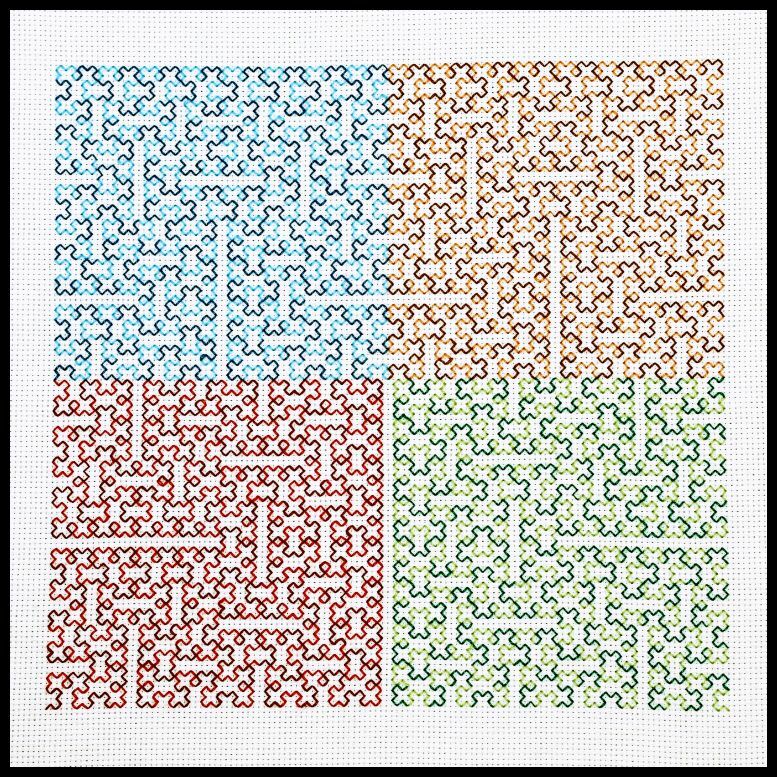 Each of the four sections uses two alternating shades of color to illustrate the basic design of the IFS based on the motif of 8 line segments at right angles. The motif is repeated throughout the design in horizontal and vertical orientations.